ALL’S WELL THAT WELDS WELL. Local artist Kate McLean stands by a piece she made for the 2018 Eau Claire Sculpture Tour, installed near Mayo Clinic Health Systems across from Half Moon Lake. The sculpture, a welded creation entitled “Big Blue,” is an example of the environmental advocacy that inspires much of her work. The whale is several feet across, assembled from many triangles and trapezoids. Kate McLean took her first real vacation to Cabo San Lucas expecting to have a good time, enjoy a break, and see a whale. What she didn’t expect was to return to the Chippewa Valley with a newfound passion for environmentalism. It was the signs that did it: Every beachside bar she visited displayed a notice of the business’ choice not to provide single-use plastics. Paired with the experience of seeing a magnificent, ocean-dwelling mammal, the visit moved her to explore a new cause. One of the ways she came up with was to incorporate it into her art. 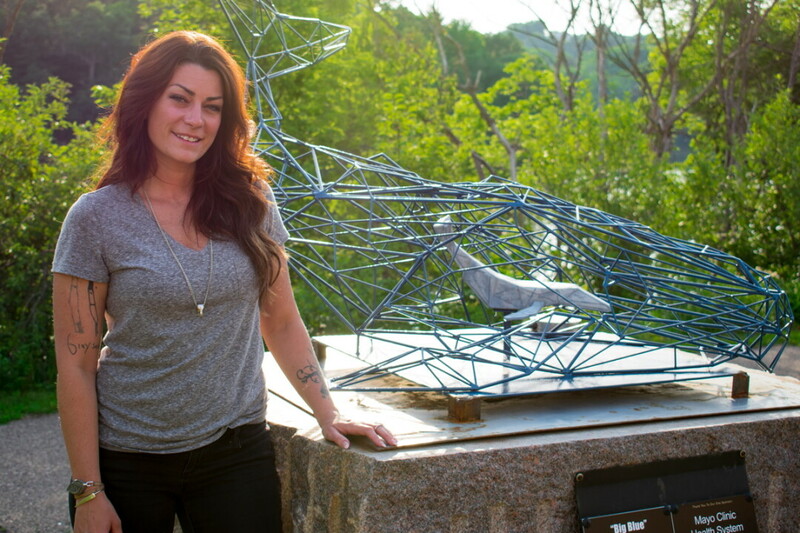 A welder with a lifelong interest in crafting, McLean considered how she could use her skills to integrate her newfound passion for environmental advocacy with her work in sculpture. The result is “Big Blue,” a welded and molded sculpture on display as part of Sculpture Tour Eau Claire in front of Mayo Clinic Health Systems. The blue whale, several feet across and assembled from many triangles and trapezoids, overlooks Half Moon Lake. A smaller whale made from molded plastic glows from within the steely structure. “The baby whale, composed of recycled plastics, is illuminated to represent the new generations of growing life so affected by the toxicity of discarded plastic,” McLean explained. Some scientists say that plastic ingestion by mother whales can poison their milk, causing a health hazard for the calves. The glowing miniature carries a morbid message despite its cute appearance. McLean took up welding as a way to make money and care for her son and herself. “I didn’t know anything about it,” she said. “It was a new challenge.” She became certified and began working as an industrial welder, a physically demanding job in a predominantly male field. In time, she moved to a smaller company where she was given the freedom to experiment, which manifested in the creation of her first welded sculpture. “It gave me the freedom to figure out what I liked,” McLean said. It also allowed her to develop her confidence as a sculptor. Later, when she wandered into Artisan Forge to find an outlet for her interest, that confidence and competency paid off. Greg Johnson, owner of Artisan Forge and Artisan Forge Metalworks, had been aware of McLean’s work. He recognized her skill and offered her a job in the studio, which she took for a spell. “When I heard that she was coming in to check the place out, I thought she was just the kind of person we want working here and representing us,” Johnson said. McLean will donate 25 percent of the proceeds from the sale of “Big Blue” to ocean clean-up efforts. Specifically, she wants to fund a program that uses a gravity-powered device that automatically skims trash off the surface of the sea. 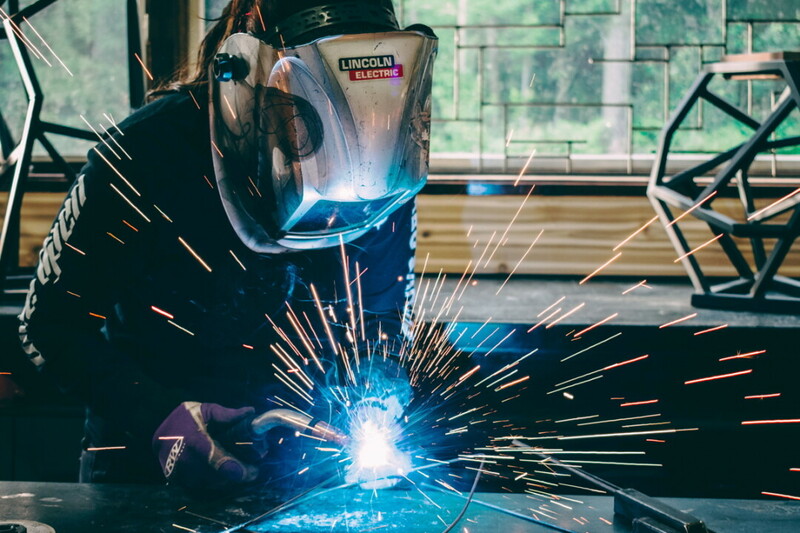 When McLean isn’t working – she now holds a position at a welding supply store – she creates independently as a furniture designer under the business name Fillmore Spaces. She builds tables, sculptures, light dressings, and more. Now that she has finished “Big Blue,” she means to take a little rest from her art. But she won’t stop promoting environmental responsibility. McLean has plans to visit local businesses to advocate for the elimination of single-use plastics in the Chippewa Valley. When she does feel ready to make more art, she wants to use more recycled materials, furthering her mission to protect the ocean wildlife that led her to Cabo San Lucas. For photos of McLean’s work, visit facebook.com/fillmorespaces. “Big Blue” is on display at Mayo Clinic Health Systems across from Half Moon Lake. One can view the piece – along with other Sculpture Tour Eau Claire works – at sculpturetour.org.